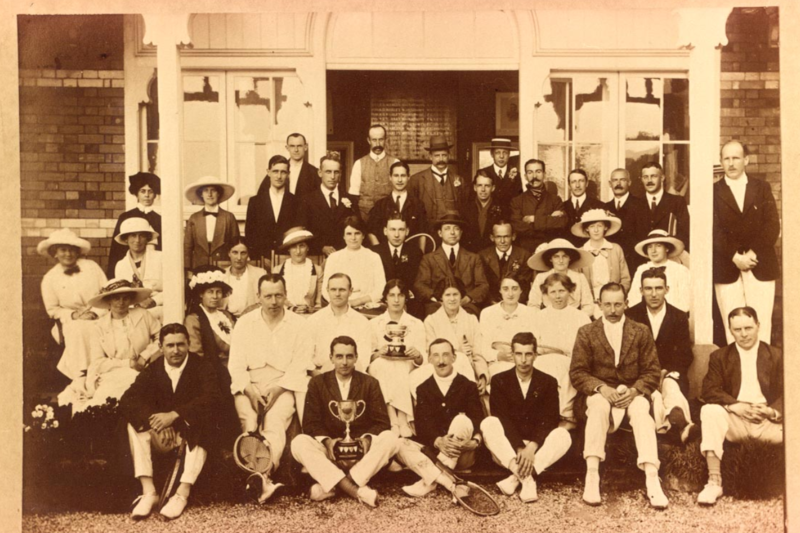 The rules of lawn tennis, as they may be fixed from time to time by the Lawn Tennis Association, shall be the rules of lawn tennis for the club. The courts are open each day until 10.00 pm. A member may play at any permitted time, depending on court availability when official coaching sessions, matches, tournaments are taking place. When using floodlights players must use their own funds for coin box. The committee reserves the right to prohibit play on any courts when it thinks necessary, and to reserve any court for tournaments or matches. No member may play more than two sets, or be entitled to play within half an hour, if other members wish to play. Members may not start to play singles when three or more other members are waiting to play. No league match or tournament shall be arranged to take place without the previous sanction of the committee. Social members are not permitted to use the courts, (except during specially designated events). Guest players may use the courts if accompanied by a full paying member. They should sign the visitor’s book, and pay the appropriate guest fee. It is the responsibility of the member to ensure that this is done. A guest can be signed in on up to three occasions in any membership year. Guest members cannot also hold any category of membership. All members should play in suitable tennis clothing and wear appropriate flatsoled footwear that will not damage the playing surface. Mobile phones should be switched off on court. Glass bottles or containers should not be taken on to the tennis courts. Players are responsible for calls on their own side of the net. They should not make decisions or volunteer opinions on calls on the other side of the net. If asked for an opinion by the opponent, they should be helpful and polite. When a player is in doubt during a rally as to whether a ball is in or out, he or she must play on, giving the opponent the benefit of the doubt. When a call is made, it must be made immediately and clearly audible. If a dispute over the score does occur, and the players cannot reach agreement, then they must resolve the problem on a point-to-point basis, counting only those points in the game on which they both agree. If the dispute is over games won, then a similar method must be used. Players should not walk onto a court when play is in progress. Walking behind players is potentially dangerous and discourteous. Help by passing balls back to the opponent for their service, and by having 2 balls ready when serving. Do not smash the ball directly at your opponent. If the ball accidentally hits them, apologise immediately. If a ball hits the net cord and drops on to the other side leaving the opponent no chance of reaching it, acknowledge to the opponent the good fortune in winning the point. Players should acknowledge a good shot by their opponent. A player should not waste time during a match. The maximum time for changing ends is 1½ minutes, and the maximum time between points is 20 seconds (and between games with no change of ends). A player shall not use an audible obscenity, make an obscene gesture, or hit, kick or throw a racket, ball or other object in anger. If a ball ends up on a neighbouring court, the player must wait until the end of the other players’ point before politely asking for it back. When playing mixed doubles against a strong player and a weak player, do not deliberately and forcefully drill the ball at the weaker player. If a player wishes to have a toilet break, he or she should wait until the end of the game and ask the opponent to be excused. Shake hands with your opponent after the match. When finished, players should collect up the match balls and return them to their owner/ organiser. Tidy up all equipment and do not leave any rubbish or litter. Only committee members, their nominees or members of the official bar rota, are allowed to serve behind the bar. Younger juniors shall not have use of the clubhouse unless a senior member is present. Drink purchased elsewhere may not be consumer in the clubhouse. ‘Last orders’ shall be called at the bar at 10.50 pm. From Sunday to Thursday, the bar will close at 11.00 pm, with ‘drinking up time’ at 11.20 pm (unless special licensing arrangements are in place). Closing time is midnight on Friday and Saturday. Door fobs cards issued for clubhouse access remain the property of the club, and should be returned to the committee when requested. They must not be loaned or given to others. Members should pay for food and drink before consumption and cannot have drinks or food on credit (eg through leaving an ‘IOU’). Smoking is not permitted in the clubhouse, or on the decking, or in other designated no smoking areas. The member to last leave the clubhouse should ensure that it is securely locked, that the alarm system is activated and that all lights and heating are switched off. Members with young children should keep them under control at all times and ensure that they do not interfere with tennis matches. Parents should ensure that children are aware of, and comply with, the rules of tennis etiquette and general behaviour when at the club. Members should endeavour to keep the club premises tidy and treat the property with respect. Casual ball games or similar activities are not allowed to be played near the courts when matches are in progress. Junior members are not allowed to be left unsupervised on club premises and should be accompanied by a parent, guardian or appointed adult. Members should only use the car park when using the club and should not leave vehicles unattended. Vehicles are left at members own risk and the club is not responsible for any damage incurred when park in the car park. Members are welcome to bring guests to use the club socially, though will be deemed responsible for their behaviour. Members should refrain from rowdy or anti-social that may upset local residents, especially when leaving the clubhouse at night. A member who has not paid his or her subscription within one month of the due date will not be allowed to use the club’s facilities or represent the club tennis teams. The committee reserve the right to apply a surcharge to late payers of subscription fees. A member who persistently breaks club rules may face disciplinary action by the committee, which may include suspension from membership or expulsion from the club. In the first instance, the committee will issue a written warning. If the behaviour persists, the committee may then suspend or expel the member. A member has the right to meet the committee to discuss any disciplinary action imposed. The committee’s decision is final on all disciplinary matters. A member who wishes to make a complaint about any aspect of the club should do so in writing to the club secretary. The complaint will raised and considered at the next available committee meeting, and the member will be informed in writing of the committee’s decision or next action. The committee’s decision is final on all such matters. Any breach of the law committed on club premises is deemed to be a breach of club rules. No dogs (except guide dogs) or other animals are allowed on the club grounds or premises. Membership subscriptions are due from the 1st April of each year. A surcharge will be payable by renewal members if they pay subscriptions after 30th April. New full playing members joining from 1st September will receive a discount, which may be varied by the Committee at any time. No subscription refunds are given. The use of club facilities for any social function or activity needs the prior approval of the committee and will be subject to a charge. The club’s annual general meeting will usually take place in February each year, for appointment of club officers and other matters. The club will not be responsible for damage caused to cars parked on club premises. The categories of membership are: honorary, full playing, country, student, social adult, social junior, junior<11 andjunior 11-17. New categories of membership may be introduced by the committee.